I came clean about Santa earlier this year. I always said that I wouldn’t flat-out lie to the kids, so when they asked me if I was Santa, I said yes. (In previous years, the questions were always something like, “Is Santa real?” to which I averted the question and replied, “What do you think?”) Now that the cat is out of the bag (no pun intended), there’s some leeway on the element of surprise. I swore off getting another pet after we had to give away our dogs a couple of years ago. Our yard is just too small, and they were eating the house (literally). I have decided that I’m a terrible dog owner. I enjoyed having a cat when I was young & single, but my ex-husband is allergic, so I gave her away before we got married. Now that he no longer lives here – and as far as I’m aware, none of the boys are allergic to cats – I thought perhaps that would be a safe bet for our next venture into pet ownership. A friend from work emailed me with news that a mama cat showed up on their doorstep and delivered six kittens. She is quite allergic, though her heart went out to the mama cat. 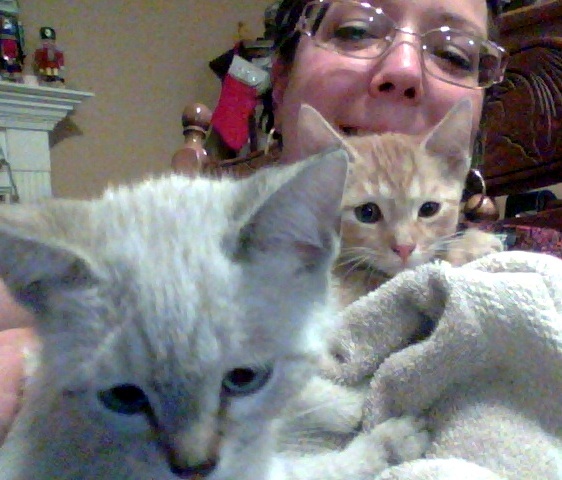 They decided to keep her (allergies notwithstanding), but they had to find homes for the babies. The kittens are 8-1/2 weeks old now. 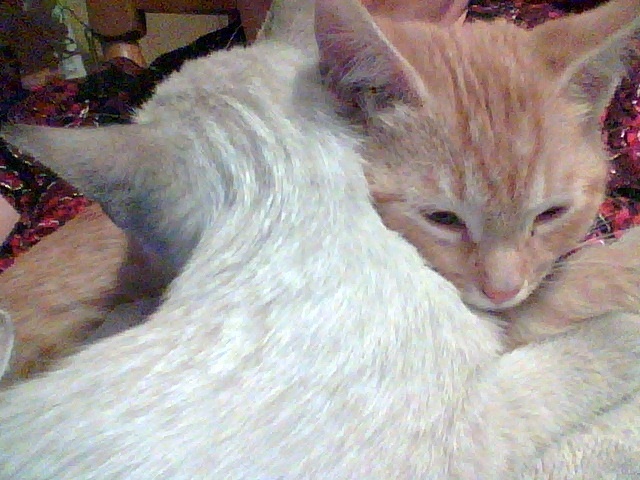 There were two boys in the litter, and it seemed like the right thing to do to bring them home. The boys were beside themselves when I told them the news. I had each of them sign a Pet Care Contract that I found online, and we talked bluntly about litter boxes and whatnot. Everyone agreed and signed the papers. 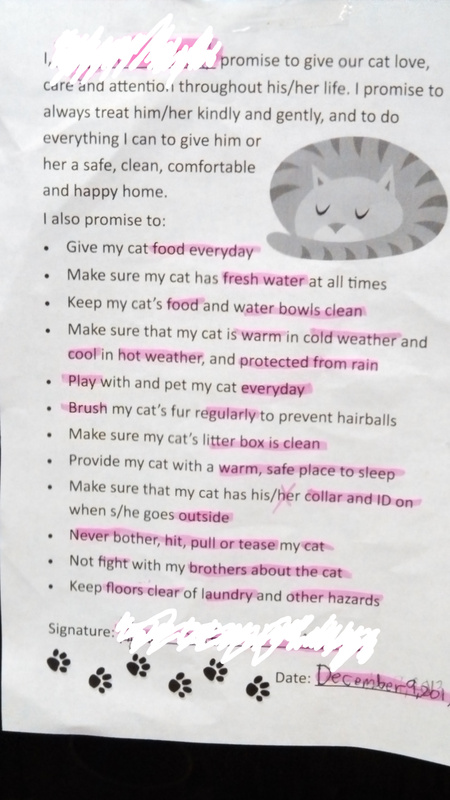 One of them even had the idea to highlight key phrases and tape their contracts to the fridge as a reminder, and everyone followed suit.